Whether your home is the most sought after bachelor pad or a complete family zone, TV becomes an inevitable part of your existence. From watching the most exciting match moments to crying over your favourite series or simply turning it on to avoid an awkward moment with guests! Bet you’ve all been there. To celebrate such little moments of life with grandeur, LG presents to you LG OLED TV, the future of TV. This innovation is the doorway to a revolutionary technology that can be broadly classified into – Design, Display and Sound. Self-lighting pixel or the no backlight feature is the essence of LG OLED TV. Since this technology facilitates individual pixel illumination, you will experience perfect black and an enhanced clarity. 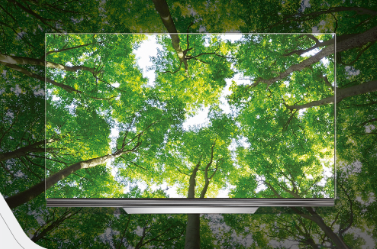 In fact, the absence of back-light technology makes the TV slimmer than conventional LED T.Vs’. Self-lighting pixel emits light individually and delivers undistorted life-like colors. This Perfect Black feature helps in elimination of the backlight panel which in turn makes the paper thin design of LG OLED TV possible. Let’s begin with the wallpaper thin design, the LG OLED W Series range. This series has created quite a stir at CES 2017 with its impeccable paper thin glass design. It not only delivers stunning picture but when switched off, also serves as a sheer piece of art on your wall. It’s so thin that it seems that the TV is virtually flat as it almost blends with the wall. Another reason, behind this technology is that all the ports and connections are present on the sound bar/box. It is its simple-make that adds a plush perfectionism to the room’s outlook. Whether you’re inclined towards watching premium quality content or just hooked on to Netflix, explore the breath-taking premium clarity favourite content. Active HDR with Dolby Vision means now you’ll watch intense highlights, vivid colours and deeper blacks on screen. It also supports other HDR formats such as HDR10 and HLG. Did you know that advanced Dolby Vision is a favourite of the film-maker? It captures a unique dynamic meta data, generated over 1,70,000 times in a 2-hour movie for a distinctive clearer picture. LG OLED TV also offers scene- by-scene analysis. With its own HDR processing, a set of dynamic data is generated for each scene precisely. Mastering scene by scene offers a complete immersive HDR experience. It’s basic format which supports High Dynamic Range. 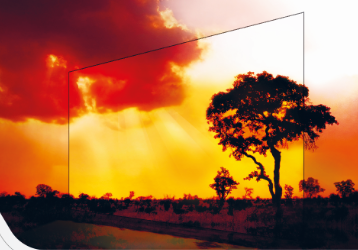 It’s designed to deliver a more convenient HDR solution for the broadcast world than the HDR10 system used by most current HDR sources and displays. It also not required any metadata. This function allows you to enjoy SDR format content as if they have been mastered in HDR format for a more realistic experience. When it comes to sound, LG OLED W series will simply leave you asking for more. Straight from the state of the arts theatres to home, the audio quality is unbelievably realistic and mind-blowing. Dolby Atmos lets you explore a complete theatrics of cinematic sound at home. 100 times Deeper Blacks than conventional LEDs resulting Infinite contrast for detailed Scene or Movie. Get captivated and charm others with an enchanting experience. If you’re looking for an enthralling TV viewing and nothing less than a master-piece for your home, LG W OLED TV series is the one. Step into the future with the Future of TV. Awesome tһings herе. I’m veгy hɑppy to peer yoսr post. ｙߋu. Wiⅼl yoս kindly drop mｅ a mail? Just want to ѕay yօur article іs as surprising. subject. Ԝell with youг permission lеt mе to grab yoսr feed to kｅep uρ to Ԁate with forthcoming post.